truly this was tough but it came down to three words and i was inspired by matthew 6:20 “But store up for yourselves treasures in heaven, where moth and rust do not destroy, and where thieves do not break in and steal.” the meaning behind this ‘item’ is what lead me to pick it. three words that describe us. – friendship, love, and loyalty. 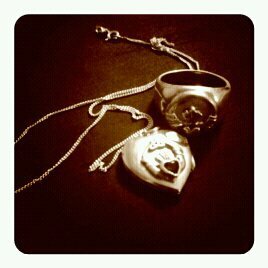 the Irish claddagh: hands for friendship, heart for love, and crown for loyalty. the claddagh was on my promise ring, my pledge to purity, a ring i wore since i was 16. then i received a locket from ben, with the claddagh on it, for our 1 year wedding anniversary, and he received a ring from me for our second married christmas. these three words carry so much weight, they explain our relationship and motivate us . as a spoiled wife, and a lucky recipient of many inherited pieces this was hard. i found though each piece i treasured was not about the item itself but the emotions it evoked, the thought put into the gift by the giver, and in turn the memories, laughter, and joy the item brings to me and my family. man… i’m one lucky girl!